In 1967 Goldberg, Schey, and Schwartz created one of the first computer-generated images of the scattering of Gaussian wave packets off wells and barriers as described by the time-dependent Schrödinger equation with the potential term . This Demonstration reproduces their results in the causal interpretation of quantum theory, which was first accomplished by Dewdney and Hiley. While distinctly non-Newtonian, Bohmian mechanics is a fully deterministic theory of particles in motion in terms of individual processes, but the trajectories are not detectable directly. The interaction of the Gaussian packet with the barrier or well leads to reflected and transmitted packets (the potential acts as a beam splitter). 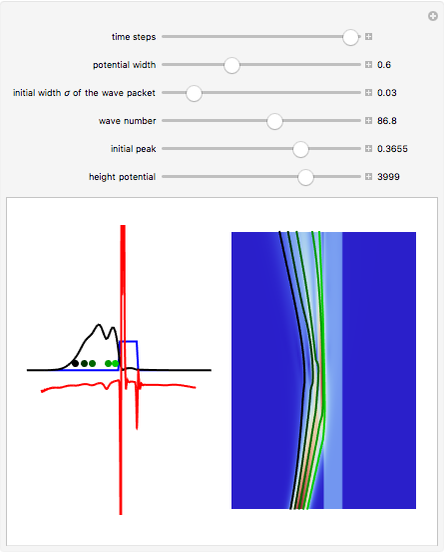 After the interaction between the Gaussian wave and the potential, the wave packet approaches the Gaussian form more and more closely as it evolves in time. The fate of a particle depends sensitively on its position, but in general, it is not possible to control the initial position of the particle in the wave packet. In the case of the barrier/well one finds that in addition to reflection and transmission there is a finite probability of a particle being trapped inside the barrier (or well) for a finite time. During the scattering process an "Airy wave packet" pattern is observed that spreads out as it propagates. The parameters in this Demonstration are chosen so that the dispersion of the Gaussian packet is clearly seen. The initial positions of the particles are linearly distributed around the peak of the packet inside the wave. 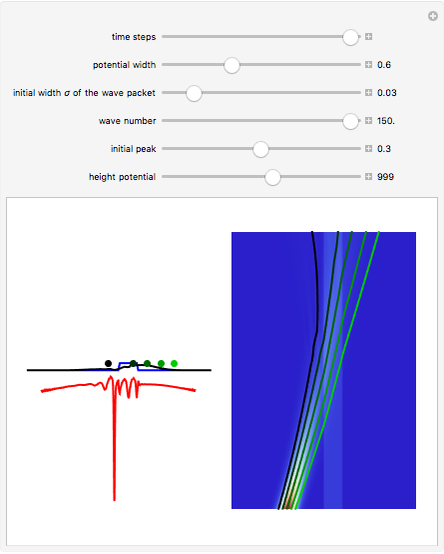 The initial unnormalized wave is , where is the initial peak of the wave and where governs the initial width of the wave packet and is the wave number. The trajectories are positioned in space. 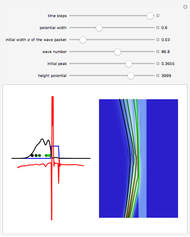 The graphic on the right shows the squared wavefunction, the potential, and the trajectories. The graphic on the left shows the particles' positions, the squared wavefunction (black), the quantum potential (red), and the potential (blue). The potentials are scaled to fit. The numerical methods to calculate the velocity and the quantum potential from a discrete function are, in general, not very stable, but the applied interpolation functions lead to an accurate approximation of the physical event; due to the numerical errors produced by the limited mesh of 120 mesh points, the velocity term must be adjusted (here using 41/100 instead of 1/2). A. Goldberg, H. Schey, and J. L. Schwartz, "Computer-Generated Motion Pictures of One-Dimensional Quantum Mechanical Transmission and Reflection Phenomena," Am. J. Phys., 35(3), 1967 pp. 177–186. C. Dewdney and B. J. Hiley, "A Quantum Potential Description of One-Dimensional Time-Dependent Scattering from Square Barriers and Square Wells," Found. Phys., 12(1), 1982 pp. 27–48. Klaus von Bloh "The Causal Interpretation of Quantum Tunneling through a Square Barrier and Well"